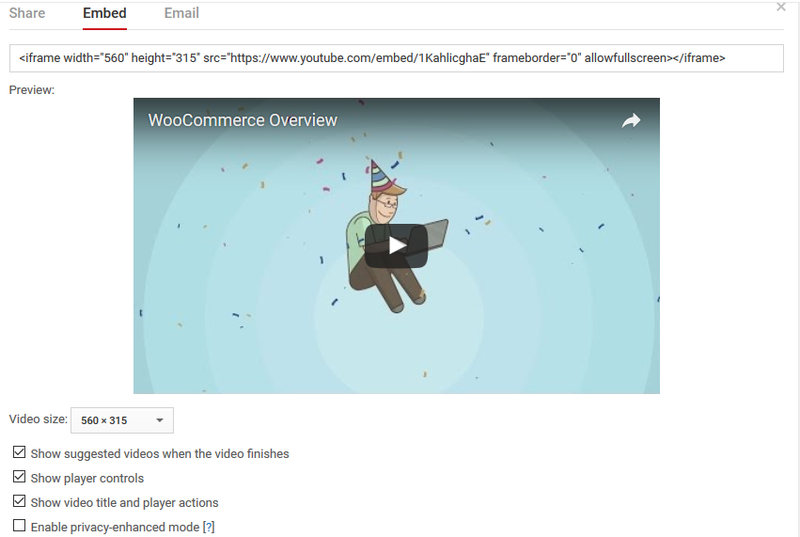 So you want to embed a YouTube video in your wooCommerce pages but find it rather difficult. You are covered. In this guide, we’ll discuss how to embed YouTube videos in your product descriptions without any hassles. This is the easiest and simplest way to embed a YouTube video into your WooCommerce product descriptions – but it’s only good if you don’t want to customize the Youtube video at all. WARNING: Do not forget to change the editor mode from Visual to Text (highlighted in red) before pasting the YouTube URL, so you do not run into sudden page load. Step 3. Click on button and see the changes. Checked the preview of your product description? Not Satisfied… Continue the hard way. In this section, we will discuss not only how to embed the articles but also how to resize and set different elements of the video frame the professional way. Step 2. Click on SHOW MORE and expand to use embed elements. NB: If you need even more options for customizing the YouTube player we offer this free tool. Step 3. Select a suitable video frame size. Step 4. Adjust player controls and video title. Step 5. Paste the code into WooCommerce editor as discussed in the previous section. Step 6. Click to check if the video appears as you wish. Step 7. Publish the changes. And, you are done! Congratulations!